Mountain bikes (MTB), otherwise known as all terrain bikes (ATB), are bikes designed for off-road cycling. They have been designed to perform on many different types of terrain and have been crafted to be more durable for the rough paths ahead. Some of the differences you will see when compared to road bikes for example would be added suspension for a more comfortable ride and to soak up the bumps. Is a mountain bike for me? It depends on what you will be using the bike for. Mountain bikes can be used on all terrains and can be ridden on the same roads that a road bike can. 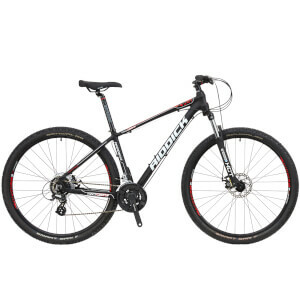 However, mountain bikes are generally larger bikes than road bikes and tend to weigh more. So, if you think you will be sticking to the roads and smooth paths then a road bike may be more suitable to you but if there is a chance you will go off the beaten track and on the rough trails then we would recommend a mountain bike. Your height will determine what size bike you should choose. You can use our size chart to give you an idea of the size bike you may need. The models shown are from our Riddick range. 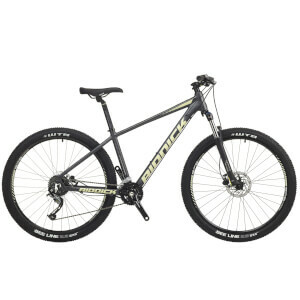 Riddick is our range of mountain bikes which offer compact geometry for excellent bike control and shorter stems; ideal for trails. All models have a lightweight alloy frame for carrying uphill, with internal cabling and flared headtube for vibration reduction. We have included a few of them below starting with our entry level model and moving up to the high spec models.